When you’re a woman and you like hiking getting the right gear is very important. Apart from the fact your gear has to be dependable and functional, it also has to look nice, to say the least. 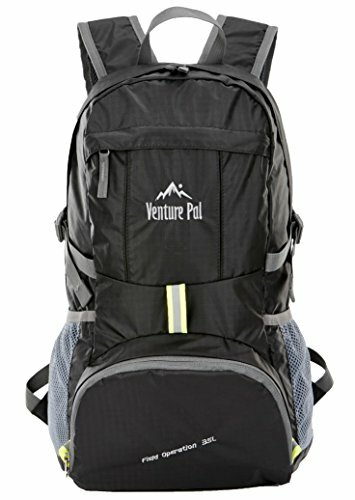 What’s a good hiking backpack for women? A good hiking backpack has to be, more than anything else, shaped so that it gives best comfort to a women hiker. You want your backpack to be large enough to fit all of your belonging, but you don’t want to sacrifice that over the comfort. A woman hiking backpack is a bit smaller than a model for men. Additionally, it features chest straps, waist strap that are going to give the best fit to women, and not men. Needless to say, a good hiking backpack has to be water and tear resistant and to have a rugged build. It has to give you plenty of space to organize your items, without adding too much weight. On top of everything else, no woman would mind for her backpack to look nice. A pretty color combination, some little colorful and cute details make a big difference and any woman would go for rugged, yet cute hiking backpack. 1). Pretty colored and great for a day hike, the Venture Pal Lightweight Packable Durable Travel Hiking Backpack Daypack is a backpack that fits great any woman. The backpack is made with good quality material that is resistant to water and tear. Lightweight, the backpack is durable and is going to serve you for a good amount of time. There are plenty of features that increase the durability of the backpack, such as the bar tacks at the essential stress points or the double-layer bottom piece. The 2-way zippers match the backpack and they’re made with SBS metal. Additionally, they don’t get stuck and the backpack is easy to open from any side. The padding on the shoulder straps is enough to provide comfort, but this doesn’t sacrifice the breathability. The sponge paddling minimizes stress in your shoulder when you’re heavily loaded and the adjustable straps make the fitting right. The chest strap is also easy to set, whereas the whistle buckle makes sure the backpack stays in place. As for the organization, the backpack doesn’t disappoint either. It has one main zipped compartment, two side pockets for your water bottles and two zipped front pockets. The main compartment is quite large (35L) and it has two separators for a better organizing of your things. Last but not least, the backpack folds into its own pocket for an easy storage. 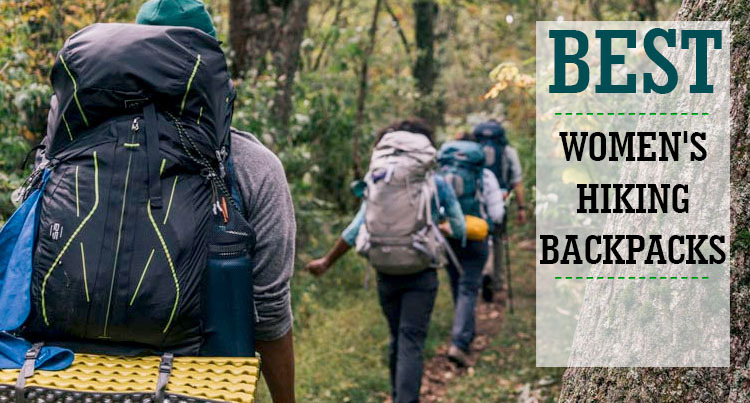 All in all, for a low price, you get a durable, dependable backpack that saves any day hike. 2). 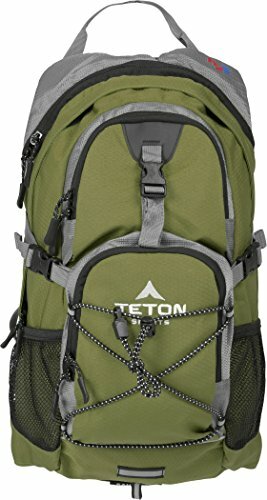 For the avid hiker that really likes to have good gear when hiking, a dependable choice and fairly priced as well is the Teton Sports Oasis 1100 2 Liter Hydration Backpack. The backpack is comfortable and lightweight despite its size and it covers most of the needs of a hiker. It comes with a BPA free 2-Liter hydration bladder and a long tube. The bladder has a 20in large opening for ice and it’s not difficult to clean it when in need. The kink-free sip tube is light and the push-lock cushioned bite valve works well. The bite valve may have a slight plastic taste in the beginning, but the taste fades away quite fast. The low profile of the backpack makes it a good choice for most women hikers. The straps are comfort-taped and the high-density notched foam stabilizer increases comfort, along the mesh covering. The storage space is good and well organized. The backpack features a large pocket with hidden-teeth zipper and a weather guard protects your items from the elements. You may find very useful the bungee cord system for bike helmet and the butterfly opening for jackets. The straps are wide and made with foam that is quite breathable. The chest strap is adjustable and a good shock absorber. The backpack is well made and the stitching doesn’t show, but there’s a durability feel attached to the backpack. For the comfort, design and reliability, the backpack is still a good choice for a woman hiker who goes shopping on a tight budget. 3). 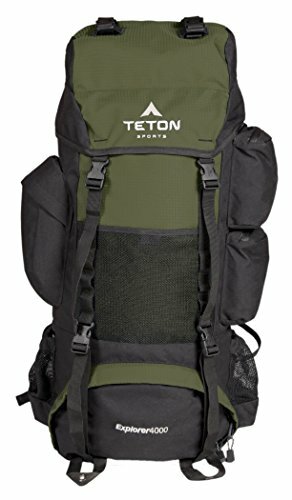 Popular and designed for both men and women, the Teton Sports Explorer 4000 Internal Frame Backpack; Great Backpacking Gear; Backpack for Men and Women is bringing so many good things to the table. The backpack is rugged and it features a tough internal frame, giving you 4,000 cubic in (65L) capacity. You may totally rely on it for a 2-5 day trips. You get plenty of storage options as the backpack features pass through side pockets, six pockets and a main compartment. You may also very well use three mesh pouches and attach more gear with the upper and lower gear loops. In order to control the volume of the backpack, you should use the four compression straps of the backpack. No matter how loaded the backpack gets, it’s still comfortable to wear it thanks to the thick lumbar and upper back pads. The torso is fully adjustable and the backpack comes with shoulder and hip straps with breathable mesh and tensioners. Let’s not forget to mention the backpack is hydration ready and able to hold up to a 3-Liter water bladder. The build of the backpack is good and the open-cell foam lumbar pad and molded channels give amazing comfort and airflow. Made with durable 6000D squared rip stop and 600D Oxford canvas shell, the backpack also features a large sleeping bag compartment and a rainfly. Nevertheless, for the money you pay, the backpack is a rugged, reliable option that comes with so many features. 4). When you’re ready to step up your game, don’t sit on the fence and give it a go with the High Sierra Appalachian 75 Backpacking Pack. The backpack is made with man-made materials and comes with plenty of features that make it ready for the more challenging hiking experiences. The design of the backpack is well thought out and it features a single contoured aluminum frame bar that you may adjust to fit the shape of your back. The molded foam back panel features Airflow channels so that you may keep your back cool and dry, no matter how much you’re moving. The capacity is big (75-L) and the backpack includes a top-load main compartment and its gusseted drawstring closure increases its durability. The top lid is adjustable, giving you the chance to add some extra items. We also notice the drop-bottom sleeping bag compartment with divider and the dual zippered pockets on the sides that are quite roomy. Don’t worry about your comfort when using the backpack as it comes with Ergo-Fit shoulder harness with adjustable load-lifters. The backpack is made with Hex-Vent mesh and high-density foam padding, which keeps you dry at all time. The Airflow channels on the molded foam back panel help you remain dry no matter how intense is your effort. The adjustable sternum strap keeps the pack in place, whereas the side compression straps secure your gear. You may easily extend the bottom compression straps when you want more storage space. 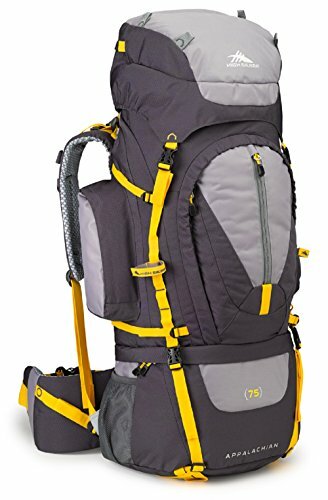 The backpack also features webbing daisy chain on both sides so you may attach carabineers and other gear, whereas the soft lashing hardware holds ice ax and hiking poles. The backpack comes hydration ready as it features an internal hydration reservoir sleeve and dual exit ports for tube. Its mesh pockets hold 1000ml water bottles. Even though it’s not waterproof, the backpack is going to protect your belongings as it comes with a tuck-away rain cover in its bottom pocket. Despite the minor problems, for the long list of features and good build, you should definitely give the backpack a try when in need. 5). 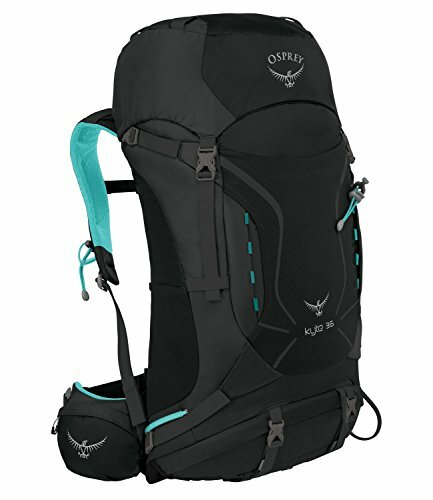 Pretty colored and dependable, the Osprey Packs Women’s Kyte 36 Backpack is a nice option to consider that does an amazing job for any long hike. The backpack is made with polyester and presents a long list of features. It comes with a stow-on-the-go trekking pole attachment so you may easily attach and carry your trekking poles while wearing the backpack. The backpack comes hydration ready and the external reservoir sleeve is well placed, behind the shoulder harness. This way, it’s quite easy to load/unload the hydration reservoir. The weight is well distributed and dual upper side compression straps put the load under control. The backpack also features low, cross functional compression straps that you may also use as external carry straps. The suspension system is effective and you feel comfortable even when fully loaded. The storing space is great and well organized. The backpack has a main compartment with top loading and side zip access as well. You may store your items in the top-lid and under lid zippered pockets, side and front stretch mesh pockets or in the two zippered hip belt pockets. Let’s not forget about the dual front daisy chains and the web attachment points on the top lid so that you may anchor your gear to the exterior. On top of everything else, the backpack also features tuck-away ice tool loops and a built-in rain cover that is also removable. The zippered sleeping bag compartment simply completes the list of good features. All things considered, for the good built, amazing list of features and beautiful look, the backpack is a definite “Yes” whenever in need. 6). Pretty and tough, the Osprey Women’s Aura 50 AG Backpacks is a nice choice for many women hikers. The best part about the backpack isn’t its looks-even though it’s sure a big plus- but its Osprey’s Anti-Gravity suspension system. The clever Anti-Gravity suspension system is efficient and consists in a seamless backpanel made of lightweight mesh. The mesh is extending from the top of the back panel to the hip belt, contouring to the body and providing great fit and freedom on the move. We also have to mention the Fit-on-the-fly hip belt and the torso length that is easy to adjust for best comfort. The hip belt pads extend 5 in to give best fit for various hip sizes. The design is well thought out and you get fast access to your gear through the top of the pack or via the zippered front panel. Continuing with the good design, we have to mention the top-lid that is easy to remove and versatile. The backpack also features the Stow-on-the-Go trekking pole attachment system so you may easily attach and carry the trekking poles. If the flap jacket protects your items on a rainy day, the internal compression and the compression straps are going to be so helpful to get some control over your load. Giving the great comfort and the list of features, we’d say you shouldn’t sit on a fence if ever in the situation of buying it. 7). 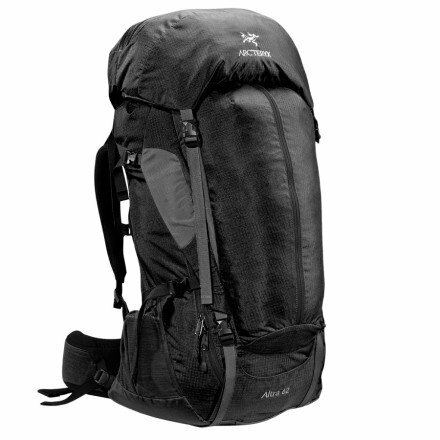 Spacious and easy to access at all time, the Arcteryx Altra 62 Backpack – Women is one backpack to rely on for a long time. The backpack is made with mesh and nylon and it’s rip stop. The composite construction is efficient and the suspension system increases your comfort, even when heavily loaded. The backpack features the Twin 6005 T-6 extruded aluminum stays that give amazing support. The backpack is anatomically shaped and your comfort is good. The shoulder straps are well padded and feature the customized GridLock adjustment system. The modular sternum strap helps you feel better when on the move, whereas the Thermoformed triple-density hip belt lets you get even more comfort. Let’s not forget about the occipital cavity that gives you freedom on the head movement. The list of great features doesn’t stop here and the backpack also comes with extendable collar with draw cord so you win more capacity. The top lid is easy to remove and it also extends and it has two zippered compartments. We also notice the padded compression wings that increase the storage space and the stretch-mesh stash pockets. The backpack comes hydration ready thanks to its Hydro Port opening and the internal hydration pocket with zip flap. A top grab handle lets you move it around easier when in a hurry and everything about the design increases your comfort. The build is amazing and we also notice the laminated zipper protector and the reinforced high wear areas. Regardless the problems, for the amazing shape, comfort and tough build, the backpack still stands as a great investment for your hiking experience.